California is often the first state in the West to test new solutions to social and environmental problems. These days, the state is at the fore of a much more ambitious challenge, as it finds its progressive ideals — and its increasingly diverse citizenry — in frequent opposition to the policies of President Donald Trump. Every month, in the Letter from California, we chronicle efforts in the state to grapple with its role in the changing, modern West. It’s been called the largest migrant caravan in U.S. history. 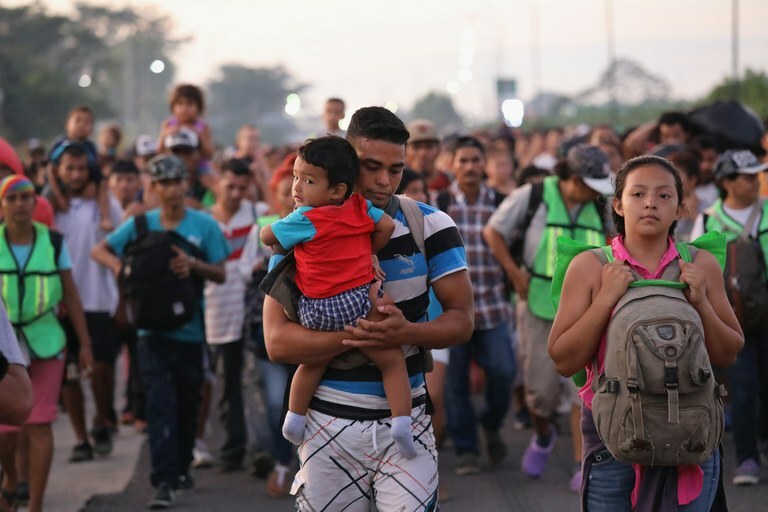 What started as a northbound group of 200 Honduran migrants has swelled, at its peak, to an estimated 7,000 people — a quarter of them children — from various Central American countries. They are working-class people fleeing violence, political instability or poverty at home, seeking a new beginning in the U.S.
More commonly known as caminatas migrantes (or migrant walks or pilgrimages), caravans are not new; for over a decade, advocacy groups have organized them on either side of the U.S.-Mexico border to raise awareness of the dangers undocumented immigrants face, including violence by criminal groups. This fall’s caravan is different: It is far bigger than past versions, and it happened organically, without the backing of an organization. In a now-retracted description, the Associated Press called the caravan “a ragtag army of the poor.” But I see this latest migrant pilgrimage as something entirely different: a bold people’s movement aimed at subverting the class disparities and strict immigration enforcement of a system deliberately stacked against working-class migrants. People with little to lose are traveling on foot by the thousands in an effort to defy the criminal networks that prey on them. And when they reach their destination, they plan to ask for asylum, as is their right — seeking mercy from a government that has openly declared war on them. “I’ve been there. I’ve had lots of opportunities there, on the other side,” said Job Reyes, one of the thousands who plan on asking for asylum. Reyes, from Guatemala, was captured fleetingly in video taken by the Washington Post. “I think I can go ahead and make it,” he said, as the video panned out to show the hundreds of people walking behind him, carrying kids and bags, even pushing wheelchairs. Migrants pass through Ciudad Hidalgo, Mexico, on their way to the U.S. border. A quarter of the estimated 7,000 migrants are children. Last April, a different caravan, organized by the advocacy group Pueblo Sin Fronteras, drew media attention — and the ire of President Donald Trump. As it neared the border, it dwindled, with some seeking asylum in Mexico and others crossing into the U.S. on their own. Those who did make it into the country, however, found themselves facing one of the most nightmarish and haphazard “zero tolerance” set of guidelines the U.S. government has ever dreamed up. The White House’s so-called deterrence policy led to the separation of thousands of kids from their families, sent their parents to federal jails, and placed children and infants in makeshift and crowded shelters under the supervision of the U.S. Department of Health and Human Services. Since last spring, 13,000 migrant children have been held in private, for-profit detention centers across the country, according to The New York Times. In open defiance of international laws protecting the rights of migrants and refugees, the U.S. government has engineered a way to hold hostage some of the world’s most vulnerable people. And yet, today, there are at least 7,000 migrants once again eager to find a way into the country. I’ve interviewed many migrants like Reyes over the years, in their home countries south of the border, and in California, where Central American immigrants often found a refuge after U.S. interference in countries like Honduras, El Salvador, and Guatemala fueled violent conflicts and drove them north to us. In cities like Los Angeles, regardless of their immigration status, they’ve found thriving social networks, work opportunities and access to education for their children. Immigrants make up half of the state’s population and a key share of its economy, from the agricultural fields of the Coachella Valley to the tech startups of Silicon Valley. The myth of the American Dream, the promise of safety and a fair wage, is as powerful today as it ever has been. It brought my mother and me here from Venezuela in 1990, and ultimately drew me and so many others to California. Once here, many migrants come to realize the dream is often a mirage, as the stricter immigration policies and economic disparities make the U.S. a less attractive destination. This latest caravan will have an especially hard time getting through: The Department of Homeland Security has restricted processing for asylum requests, so many may not be able to even apply. But I think of people like Verónica, a single mother I met eight years ago at a shelter for deportees in Tijuana. She was caught living in Los Angeles with a fake Social Security number and deported for the third time. Defiantly, she told me she’d cross the border illegally as many times as necessary to get back to Los Angeles with her kids, where her boss had told her he’d re-hire her any day. The hard-line immigration policies of the Trump administration cannot undermine America’s lure, and they never will. Because single mothers like Verónica, despite being caught illegally and deported time after time, will never give up hope. There is still a chance that comprehensive immigration reform, so long awaited, will finally occur and allow them to stay. There’s a chance that men like Job Reyes, despite the pain of the long journey north and the fear of detention, will be able to start over in a state that’s home to 350,000 other Guatemalans. Best of all, there’s a chance that their children will thrive as well — go to school and find jobs and make a home in California, despite the tremendous obstacles they face. Ruxandra Guidi is a contributing editor at High Country News. She writes from Los Angeles, California. Email her at [email protected] or submit a letter to the editor.